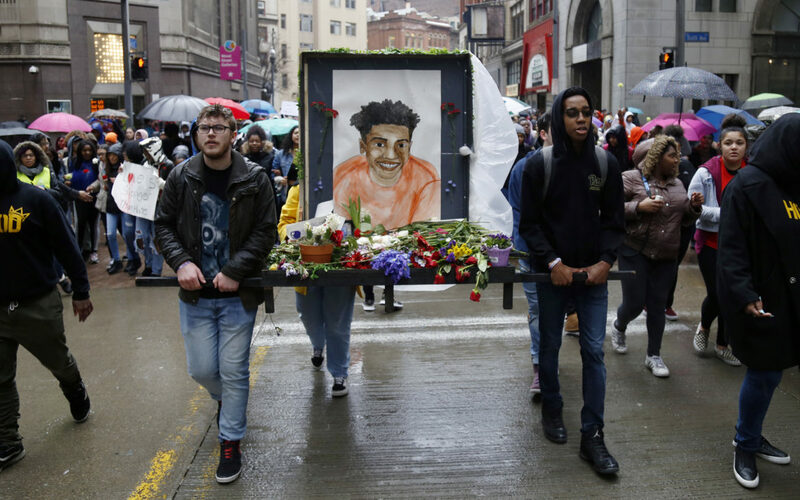 Students left school and turned out in droves to honor Antwon Rose II on the first school day after the verdict that sparked a weekend of protests in Pittsburgh. To some, 17-year-old Antwon was a classmate and friend. 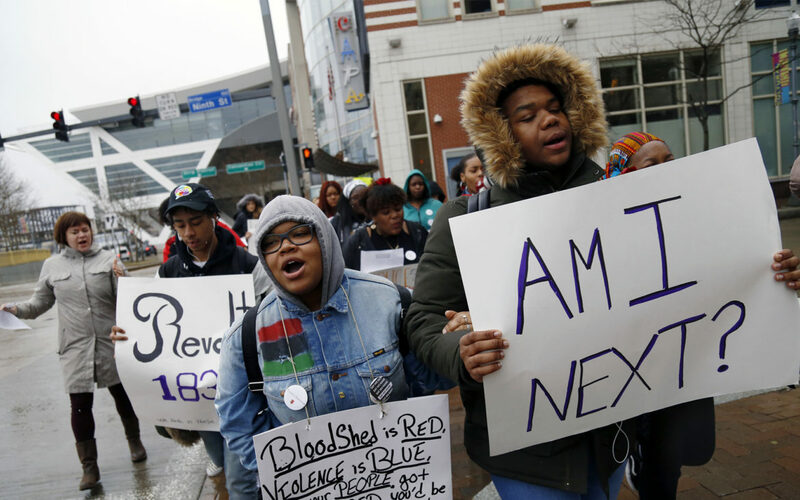 To most in the crowd gathered Downtown mid-day Monday, the black teenager shot to death by a police officer is a tragic example of racism in law enforcement and the legal system at large. On Friday evening, a jury acquitted former East Pittsburgh police officer Michael Rosfeld in the shooting death of Antwon. Immediately after the verdict, protesters filled the corner of Grant Street and Fifth Avenue by the courthouse. 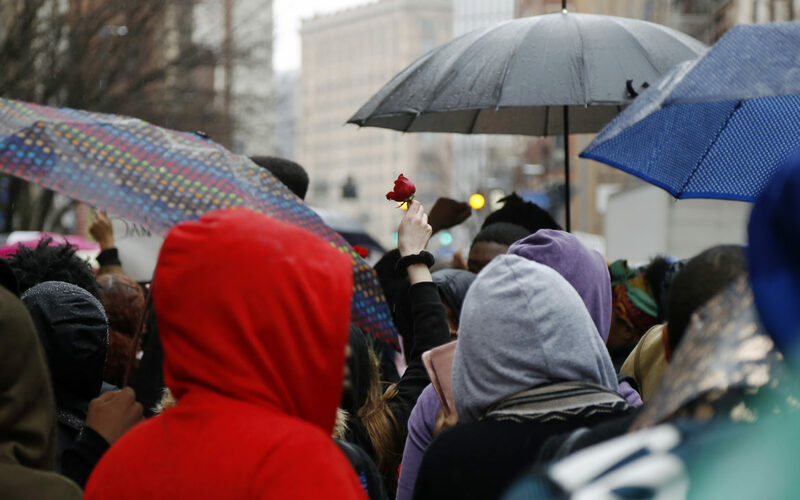 Throughout the weekend, those grieving and seething filled streets in the Hill District, Downtown, East Liberty and Rankin. Antwon's mother, Michelle Kenney, asked a group of students at the Woodland Hills High School not to join the walkout on Monday. In a video posted online, she is seen asking them to stay in their classrooms, focus on their education and lay the path to a future where they can change policies and practices — the kind that may have saved her son or, at least, earned him some justice in the courtroom. 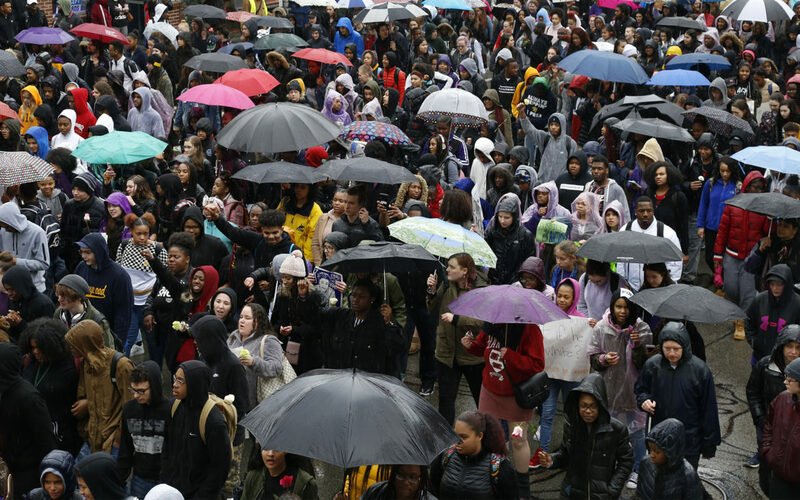 Still, students from several area schools answered the call to demonstrate in what turned out to be a soggy afternoon. 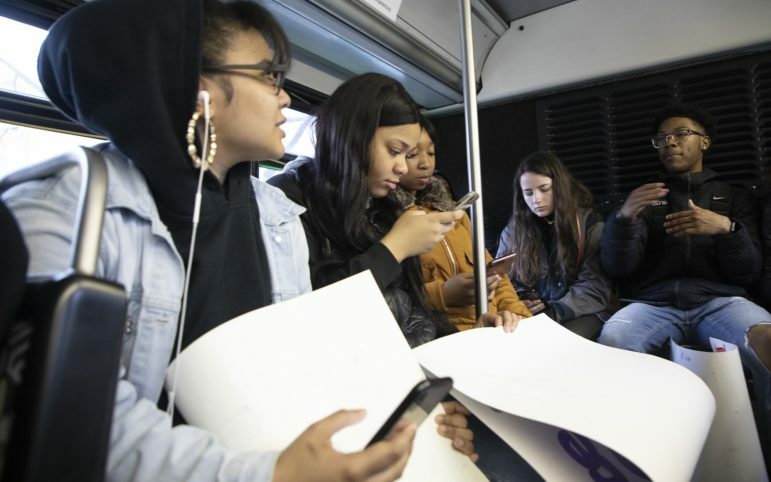 Students from Taylor Allderdice High School and Pittsburgh Obama Academy of International Studies took a Port Authority bus Downtown to join hundreds of others. 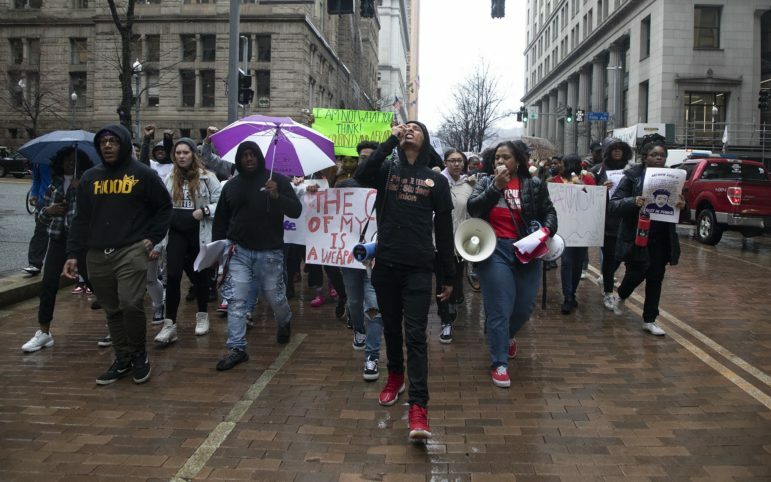 Students from Pittsburgh Creative and Performing Arts [CAPA] streamed out of their school just before noon, heading toward the Andy Warhol Bridge to join other students who had started gathering to protest. 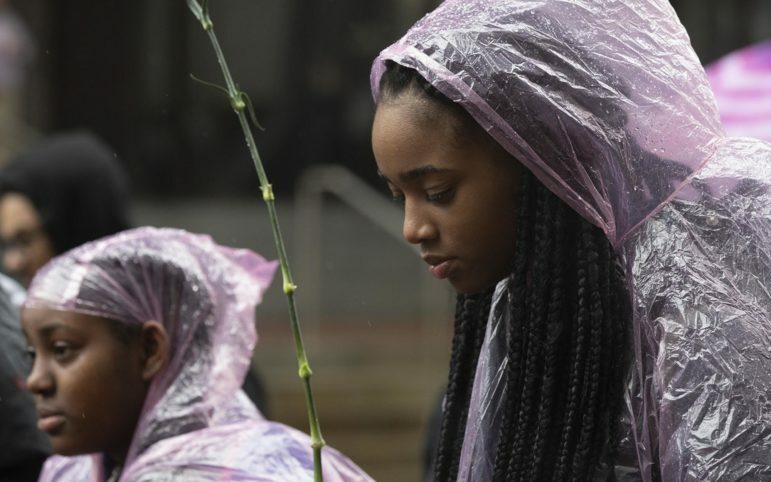 For CAPA junior Naijah Simon, Friday’s verdict aquitting Rosfeld showed her that Pittsburgh isn’t as livable as she had thought. Simon helped organize the CAPA walk-out and has been working with the Youth Power Collective, a youth organization that former CAPA students Nia Arrington and Christian Carter helped to start. Simon said she got involved in the walkout because the lives of black and brown children in Pittsburgh are being attacked. “To see [this] happen in this city, the city that I live in, to me is egregious so I came out here in support,” Thompson, a junior, said. His friend Atticus Crowley, who was marching with him, added that it was important for him to join the march because the two of them have black friends who they need to support. “We got friends that we need to protect and that's very important,” Crowley, a junior, said. 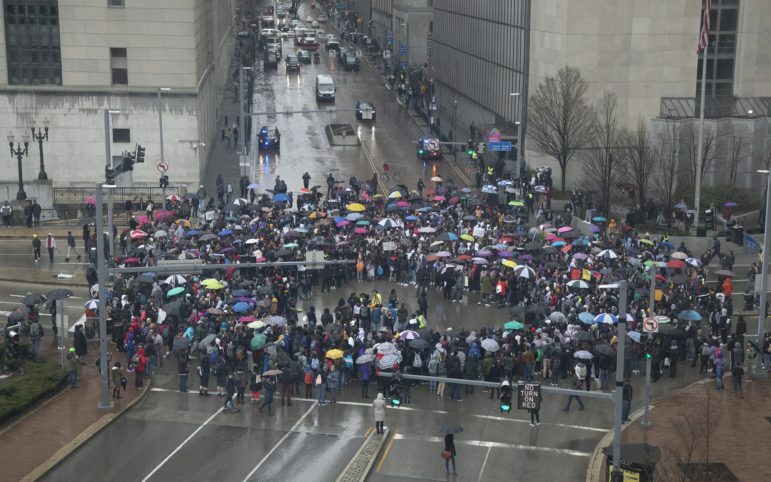 Pittsburgh police estimated that about 1,000 people participated in the march. Arrington, one of the student organizers who also works with One Pennsylvania, said she was in shock at how many young people joined the march. She said it was the largest student-led action that she’s been a part of organizing. 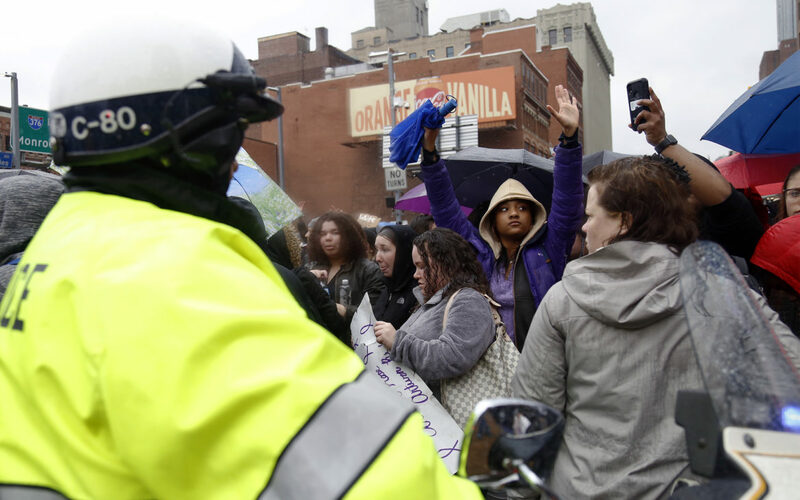 The one disappointment, she said, was Pittsburgh Public Schools’ lack of support for the march. 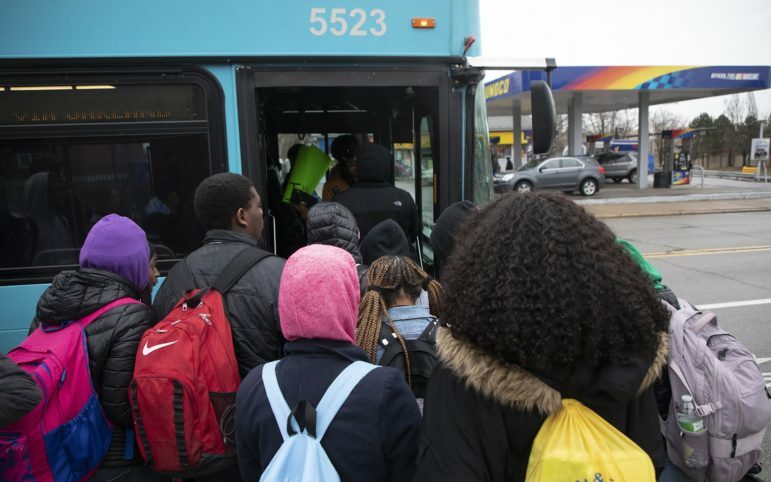 Superintendent Anthony Hamlet issued a statement Sunday evening saying he couldn’t support students joining the protest because the district is responsible for students’ safety during the school day. 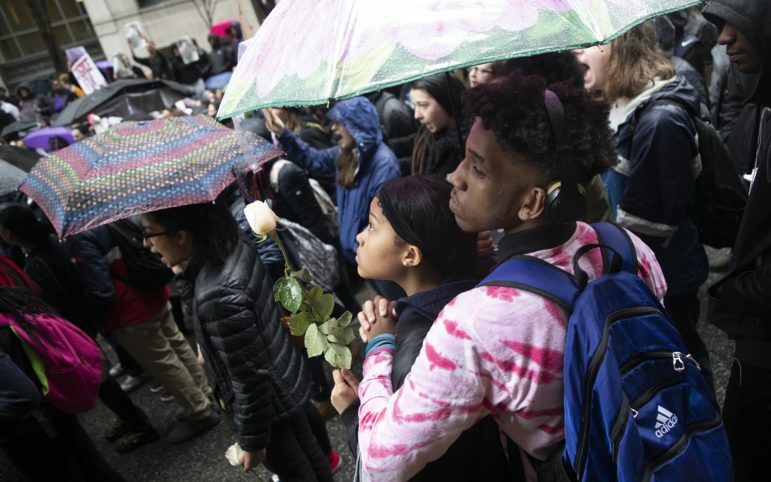 Arrington, however, pointed to the Environmental Charter School as an example of a school supporting its students and allowing them to participate in the march. The throng of students and other protesters convened at the intersection of Grant Street and Sixth Avenue before turning and marching down Grant Street toward the Greyhound bus station. As they made their way there, CAPA junior Ceu Gomez-Fauok said he joined the march because Antwon’s death was personal to him. He knew Antwon’s girlfriend and has friends who knew Antwon. He said it was unjust for Rosfeld to shoot Antwon in the back as he ran away. As a white student, Gomez-Fauok said he wants his non-white friends to be afforded the same rights and privileges he enjoys. Once the students reached the intersection of Grant Street and Liberty Avenue, they paused and occupied the intersection, at one point letting out a cheer for Antwon. Other students who marched said they felt it would have been wrong to not join the protest, instead going about their daily lives. 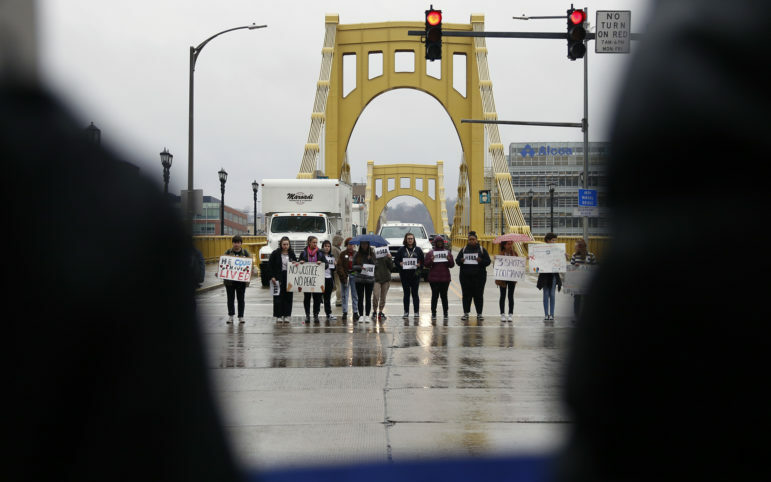 “It would’ve been wrong to go to classes and do work when someone will never get that opportunity to do that again,” said Elsa Eckenrode, a student at the University of Pittsburgh. “Black lives matter,” the students chanted. “What?” Carter shouted back at them. “Black lives matter,” the students responded. After rallying at the jail, the students made their way back to the intersection of Grant Street and Boulevard of the Allies, where they formed a circle around the intersection. Though police attempted to block traffic ahead of the marchers, several drivers were caught up by the protesters, with one car caught in the students’ circle for a period of time. Carter said he was impressed by the showing the students made. The march, he said, showed that students can organize and mobilize and “raise their voices for justice.” He said next steps include getting the students who showed up engaged in local politics. PublicSource photographers Ryan Loew and Kat Procyk, reporter J. Dale Shoemaker and community correspondent Jourdan Hicks contributed to this report. Pittsburgh city council passes landmark gun legislation. NRA prematurely said it filed suit. Pittsburgh City Council members passed three bills aimed at curbing the use of guns in the city on Tuesday. Hours later, the NRA filed suit. Antwon Rose Sr. spoke to about 200 people gathered at Freedom Corner in the Hill District on Saturday. 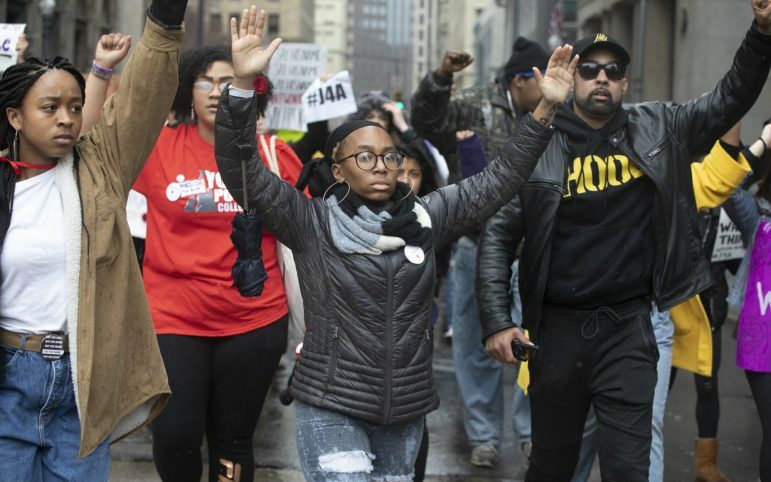 They had gathered for what was billed a Community Solidarity Service in response to Friday's not-guilty verdict in the fatal shooting of his son, Antwon Rose II. Former East Pittsburgh police officer Michael Rosfeld has been found not guilty in the June 19 fatal shooting of Antwon Rose II. Rosfeld, who was charged with criminal homicide, killed Rose in a traffic stop.